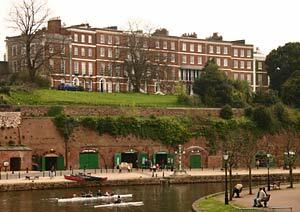 This is perhaps the finest group of late Georgian houses in Exeter, and were built by Matthew Nosworthy. The crescent is built above the quay and has a fine view over the river, canal basin and towards Haldon Hill. The foundation stone was laid by Louisa Colleton on 3rd September 1802. Each end of the crescent is a three story house, with the main block consisting of four storey houses, some with decorative iron verandas. This was a time of expansion in Exeter and fine building's at Dix's Field, Barnfield Crescent and Southernhay were also built by Nosworthy. 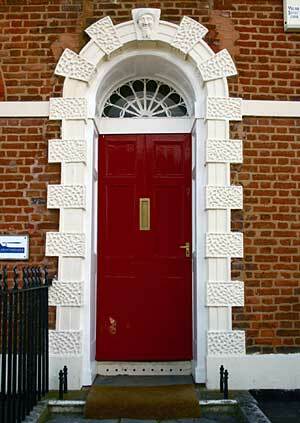 There is some detailing around the doors in 'coade stone', a type of ceramic, invented in Exeter by Eleanor Coade. The origin for the name is John Colleton who introduced, in 1737, a species of magnolia to England from Carolina. It was Thomas Floud, Mayor of the city who chose the name for the new crescent. The Crescent had a certain cachet from when it was built. The residents expected their crescent to have the latest features and James Cossins wrote of one – "in front of each house is a relic of bygone days an iron framework for oil lamps." Alexander Jenkins also wrote of the green below the crescent in 1806 "....a fine terrace walk is to be made, which will be near 100 ft above the bed of the river, from this walk, and from the houses, there is one of the most charming prospects imaginable, the navigable River Exe, the shipping, and crouded quay beneath, whilst the elevated situation protects from the damps of the one, and the noise of the other." The walk was eventually closed as the quay below was developed. The crescent was often used by the military for parades and assemblies on special occasions. On the 75th birthday of George III in June 1813 it was reported that "At noon the Royal Artillery fired a royal salute of 21 guns in front of Colleton Crescent...." It was also the assembly point for the Royal Devon Yeomanry Cavalry before they marched to Honiton to relieve the East Devon Squadron, in 1817, just one of several assemblies over the years. When the Royal Albert Memorial Museum was in the planning stage, the committee appointed a curator to start collecting objects and artifacts, and a house in Colleton Crescent was used as a store. The fine view from the Crescent across the river to St Thomas was gradually eroded as heavy industry expanded at Haven Banks, and along with the growth of the basin and the construction of two new gas holders by Willey's at the Gas Works, in 1878, the residents felt they had reason to feel aggrieved. Not only the view was degraded, but residents along the river from St Thomas to Colleton Crescent suffered increasing pollution and unpleasant smells, especially from the gas-works. In 1877, the residents of Colleton Crescent gave evidence in a prosecution of the works regarding the nuisance, and complained that the value of their properties had suffered as a consequence. Another fear of the residents was the increasing quantity of petroleum and benzoline imported through the quay and stored in the arched warehouse in the cliff under the Crescent. In 1876, Captain Thompson of the Crescent, presented a memorial to the Council regarding the landing and storing of naphtha on the quay. Although a guard was placed on the barrels, he was afraid that the danger posed by the oil, which could burn in water, would result in all the vessels and many buildings on the quay being destroyed in a fire. The Council decided to apply the Explosives Act to the landing and storage of petroleum products. By 1883, Rowe and Co were storing up to 225 barrels of benzoline in one of the arched cellars beneath the Crescent. A serious oil fire in an adjacent cellar belonging to J L Thomas and Co, in November 1882, did not spread into their store, and was confined to the single cellar. The French and Prussian Vice-Consuls were both based in the Crescent in 1852. The crescent has also appeared on television, in the Onedin Line, and has also been drawn and painted many times, including by the artist, J M W Turner. Preston Street was named because it was the street of the priests who lived there in the late middle ages. Similarly, Colleton Crescent could almost be said to be the street of the priests when the occupiers of the houses from 1897 are considered. 9 Crompton Reginald Hamilton Rev. Arthur Hayne B.A. 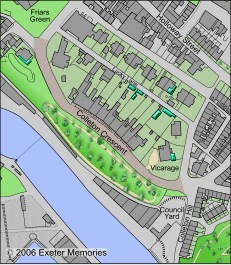 Colleton Hill runs from the end of Colleton Crescent down to the river. Unlike the crescent, these are not grand Georgian mansions, but simpler artisans houses. However, they are very desirable as they command a good view across the river. FORD, Corporal, Ivan, Duke of Cornwall's Light Infantry. 21 November 1918. Age 24. Colleton Buildings. Source: Various sources including Exeter Architecture by Hugh Meller and Kellys' 1897. An entrance door with Coade stone surround at Colleton Crescent. 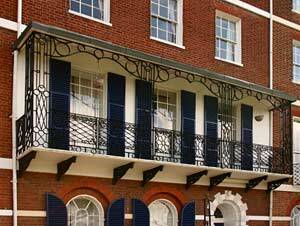 An intricate balcony at Colleton Crescent. 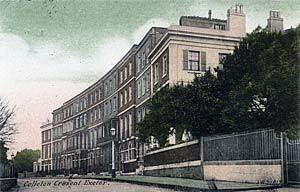 The cellars used for storing petroleum are located in the cliff face beneath Colleton Crescent..